I won’t pretend that Last Poems contains his absolutely best work – that, I think, would be found in The Morning of the Poem from 1980. But what there is here is enough to give a strong sense of the keenness of his observation, the delicacy and precision of his style and the breadth of his interests, ranging from the jazz singer Mildred Bailey to the lives of birds, the glories of roses, the shifts and sorrows of the seasons. Along with Schuyler’s poems [and yet another of Jamie Keenan’s wonderful cover designs] the book includes a six page Afterword by another fine poet, Lee Harwood, in which he writes about Schuyler’s work with affectionate understanding, and which would be worth the price of the book itself. If you were paying for it, which, in this instance, you’re not. I’ve got a half dozen (or so) copies to give away in celebration of National Poetry Day – and because they should be being read, not gathering dust on my shelf. Just email me at john@mellotone.co.uk with your mailing address and I’ll send you one by return. Can’t say fairer than that. *Living and teaching in Stevenage in the early to mid-70s, whenever possible I used to set aside all other engagements in order to listen to Honky Tonk, the programme Charlie Gillett presented on Radio London between 1972 and 1978, and which included about as broad a range of music that could be loosely categorised as rock ‘n’ roll as possible – from J J Cale and The Coasters, via Graham Parker and Dion, to Manu Dibango and the original demo version of Dire Straits’ Sultans of Swing. **Okay proud moment coming up. It took place outside a bookstore in Venice Beach, Los Angeles, where I was due to give a reading as part of a West Coast book tour [those were the days! ]; I was waiting outside beforehand, chatting to some of the people who’d arrived early, when a man came over and introduced himself as Charlie Haden. He couldn’t stay for the reading, he explained, as he had a gig later, but he just wanted to tell me how much he’d been enjoying my books – his son worked in the store and had recommended them – and he wanted me to have something in return, a copy of his latest CD with Quartet West. Oh, and let me go on record here – much as I enjoy the Quartet West CDs and Haden’s other work as both sideman and leader, my all-time favourite, and one of my favourite recordings ever, is Steal Away, with just himself on bass and Hank Jones at the piano, playing a selection of Spirituals, Hymns & Folk Songs. Perfection. 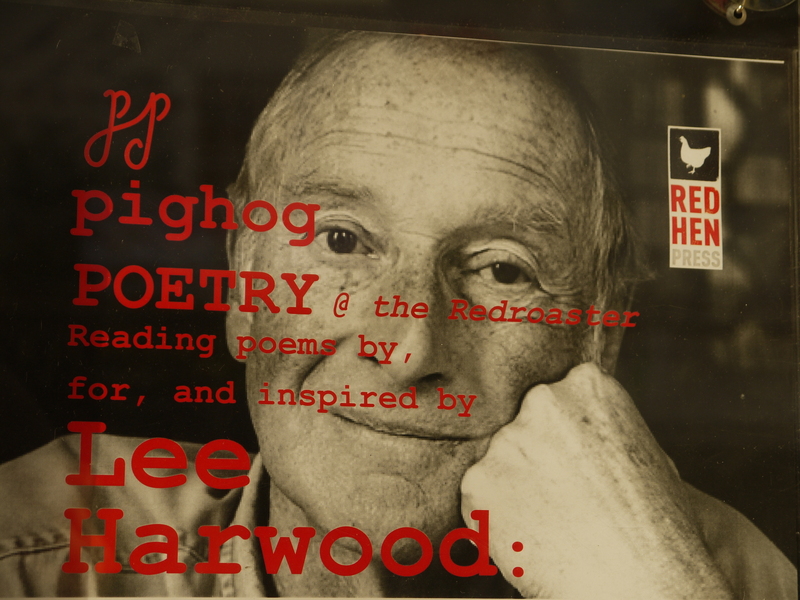 ***Lee Harwood was perhaps the first poet – the first living poet – whose work I responded to strongly both on a personal level and as an aspiring writer – it took me many years to steer my poetry away from sounding like pale imitations of his and it’s a spell I fall under still. There are worse faults, I’m sure. I was fortunate enough to get to know Lee as a friend and to publish some of his work through Slow Dancer Press. [Dream Quilt, 1985; In the Mists, 1993; Morning Light, 1998] On the last occasion I saw him, before his sad death in 2015, we were both reading with the John Lake Band on the South Coast, not far from where he lived in Hove, and his voice was a soft and inimitable as ever. A lovely, lovely man and a wonderful poet. Sometime in the early Nineties I did a very brave thing. I took myself to a poetry reading. I went on my own. I knew nobody there and none of the poets who were reading. The reading took place in the Voice Box on the top floor of the Festival Hall, at London’s South Bank. I was terrified. For a start, everyone seemed to know everyone else. There seemed to be a lot of kissing. It was a bit like showing up at church. Next, I saw immediately I had woefully misjudged the dress code. The crumpled writer look (grandad shirts and jackets; cursory and floating dresses) was very much de rigueur. Retro ice cream salesman shirtsleeve stripes and baggy shorts were very much not. For safety, I sat somewhere near the back, praying no one would speak to me. The evening was hosted by a very impressive and confident looking man wearing the most crumpled suit in the room. He introduced himself as John Harvey, editor-in-chief of Slow Dancer Press, the reading’s sponsors. He told us a few jokes, and explained in a manner that was both light-hearted and somehow menacing that Slow Dancer really did need our money and we should all subscribe to its poetry magazine. He pulled from his suit pocket a pale looking book of poems, which turned out to be his. With great seriousness and tenderness he read us a poem. The room went very quiet. At the end of the poem we clapped and John introduced us to the evening’s first poet, Lee Harwood. Lee also seemed very sure of himself. He shuffled papers and old copies of his books and gave the appearance of not knowing what he was going to do next. At the same time he seemed ruthlessly calm and in control of everything he said. His poems seemed carved out of a different language to me, especially those about the natural world and climbing, of which he read several. For twenty-five minutes I did not hear myself breathing. 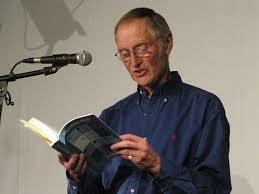 When Lee had finished reading we clapped and John got up and read another poem and again I seemed to stop breathing. The poem was about Chet Baker, I think. Then he introduced the next poet, Libby Houston. I wasn’t sure then, and am still not sure now, what to make of Libby Houston’s reading. (I mean this as the strongest praise I can offer). By turns hilarious, unflinchingly honest, deadpan, slapstick and wildly lyrical the words of Libby’s poems seemed to pour out of her at a variety of speeds. Sometimes they came in a torrent, and sometimes in a whisper, almost like a child. But they all seemed to contain vital energy and truth, including the knowledge that Libby herself did not fully understand where some of them seemed to be coming from. In the twenty or so years of going to poetry readings since, I have still not heard anything like it. When Libby had finished John stood up and said we would need to recharge our glasses during the interval, which was now, and while we were about it please could we buy some Slow Dancer books and magazines. At this point of the evening I became aware again of my lack of knowledge of poetry reading protocol. People walked purposefully around the room in the direction of the poets who had read, including John and the evening’s final poet, Peter Sansom. I noticed that many of them were holding open the books and magazines they had bought from the table at the back. This seemed to me the best way of engineering a conversation with one of them without appearing strange. I bought myself a couple of back issues of Slow Dancer, and waited in what looked like the most busy queue, which was the one for Peter. I had been sending Peter Sansom my poems to The North, and had even bought one of his books. In truth, he was probably the reason I went to the reading in the first place. For reasons I had not stopped to analyse I thought of him as a bit of a hero. So as I edged nearer to him in the queue I began to grow very nervous. I realised I had no idea what to say to him. If I said my name that would appear boastful, as though I was expecting him to know it. If I mentioned that I’d been sending him poems that would also look self-promoting, as though my poems were somehow more memorable than the thousands of others he received each week in his mailbag. On the other hand I could hardly resort to what I was overhearing others saying to him further down the queue, most of which sounded like offers of a place to crash for the night. When it came to my turn l blurted to Peter everything I promised I wouldn’t in the queue. Amazingly, he seemed to know exactly who I was. 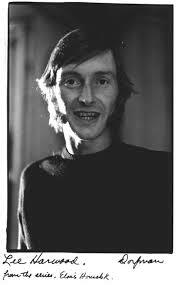 He appraised me for a moment, shook my hand, and taking from my other a Slow Dancer to sign said: ‘You’re looking very cool, Anthony.’ His reading, from his soon-to-be-published January, was similarly generous: full of anecdote, good natured red-herrings and warmly lyrical. The evening’s final act, a late night solo, it occurs to me now, was a reading by John. From the same pale book he chose its title poem, ‘Ghost of a Chance’. To the now familiar pin-drop quiet and lack of oxygen I now became aware of moisture gathering in the corners of my eyes. As one of John Ash‘s poems puts it, the surprise was ‘like a snowball in the back’. I’ll never forget it. he has started to bleed within. someone has just slipped in. he closes his eyes and blows. 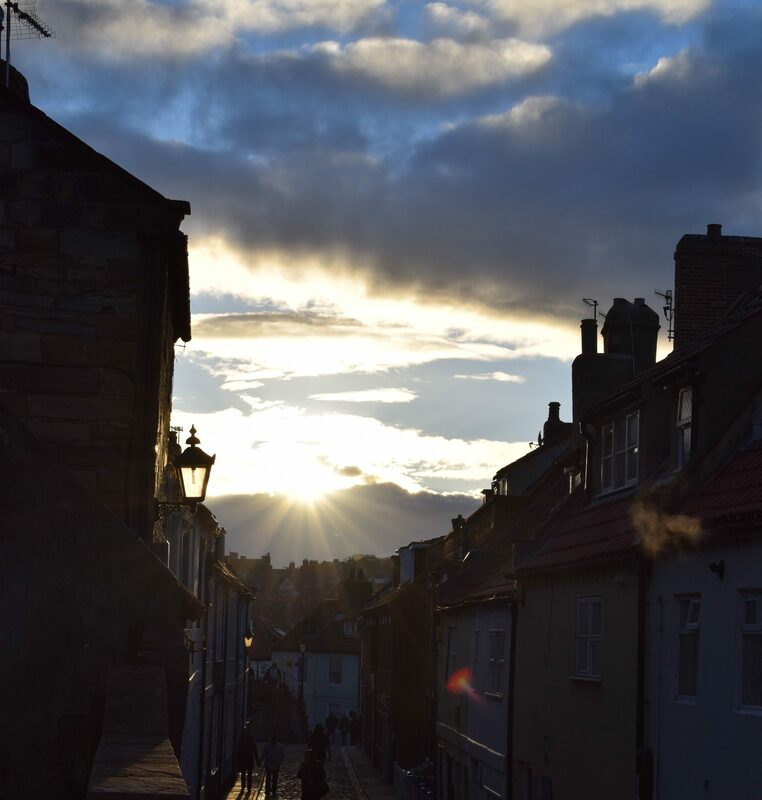 For its current issue, The North asked thirty poets to nominate the poetry book that has meant most to them in the past 30 years, with the opportunity to nominate an anthology and a pamphlet should they wish. For me, it was always going to be a toss up between Lee Harwood and Robert Hass and, in the end, it was Hass’s Human Wishes that won out. Published in 1989, and so just inside the 1986 cut-off point, while being a favourite, it isn’t, in all honesty, my actual favourite of Hass’s work, which is the earlier book, Praise, but that was first published in 1979. This is a letter of apology, unrhymed. Rhyme belongs to the dazzling couplets of arrival. of stubble corn in upstate New York in February. against the wish for spring. The pamphlet I chose was Lee Harwood’s The Books, a tiny 8 page booklet published by Longbarrow Press, which comes in an envelope also containing an equally small CD of Lee reading, that was recorded in Brighton in April, 2011. She climbed down from the tree a queen. across golden stubble to the river. I didn’t choose a favourite anthology, because, if I were to stick reasonably close to the truth, my favourites, in so far as The North is concerned, were published too soon. Amongst the other poets choosing their favourites of the past 30 years in The North are Mimi Khalvati, Ian McMillan, Helen Mort, Sean O’Brien and Matthew Sweeney. Amongst the authors chosen, Thom Gunn, Sharon Olds, Seamus Heaney, Moniza Alvi and Phiullip Levine. To find out more about The North and/or to order a copy of the current issue, go to the Poetry Business web site. The first book of Tom Raworth’s poetry I bought was The Relation Ship; a second, 1969, edition of the book originally published by Goliard Press two years previously. Goliard, later Cape Goliard, being an important small press – vital, at the time – set up by Raworth himself and Barry Hall. I would have bought it almost certainly at Compendium in Camden Town, discovering Raworth round about the same time as I did Lee Harwood, Gary Snyder, Robert Creeley and Edward Dorn. And I’m surprised, reading these early poems again now, the extent to which, in some, Raworth sounds like Harwood and vice versa. This is Tom, but it could be Lee – the title, especially. Towards the ends of their lives they were both living in Brighton and Hove – the same ships, the same sea. The last time I saw Tom was in September, 2015, when, with others, we were reading at the Red Roaster Café in Brighton, as part of an evening celebrating Lee’s life and work – he had died that July – and that’s where the photograph of Tom at this top of his piece was taken. He may have needed a little help up onto the stage, but, as I’ve said elsewhere, when he read he read like a lion. Last Friday after two days of tests, scans, bone-marrow extraction and so on, our Doctor came in the evening to say the cancer had badly metastsized…to bone marrow, liver, right lung, kidney and small bowel. Nothing to be done except palliative care and that I had at most two weeks to live. So that’s it. I can’t see I shall ever get back here. Emails will reach Val val.raworth@gmail.com who obviously will pass along to me whatever she can. Bits of it all have been fun and it’s been a decent run. He died on February, 8th, the world a lesser place. Thursday of last week saw the first of what is, for me, a surprisingly long list of readings, mostly of poetry with, here and there, a modicum of prose levered in. Totally Wired is a monthly series that takes place in the Wired Café Bar in the centre of Nottingham, and organised by the poet, Becky Cullen, along with two lecturers from Nottingham Trent University – Rory Waterman and Andrew Taylor – both poets themselves. It’s no surprise perhaps that the majority of the audience are on the young side [let’s face it, anyone south side of fifty or so registers as young to me these days] or that a good number – the majority? – are students from NTU. What is a surprise is how many people are there, extra chairs having to be hauled up from the back of beyond, so that by the time Andrew has gone round collecting the names of those poets who want to read from the floor and the event is due to begin there’s a real sense of being squeezed up close to one’s neighbour and sharing their air – in my case, that of my daughter Molly Ernestine, who’s come along for moral support and is prepared to step into the breach should I falter. The first four readers do two poems each, good poems read well, and, after an introduction from Andrew, I’m on. One of the most difficult things for me, when working out which pieces to read, is what to begin with. It doesn’t want to be too long, too obscure, too – for God’s sake – too dull. I used to make a habit of kicking off with “What Do You Say?”, a sort of riddle of a poem, to which the answer is the saxophone player Roland Kirk – which is fine when I’m doing a poetry and jazz gig with the band, but less successful otherwise – most people tend to scratch their heads in mild bemusement and I can’t say I blame them. So, emboldened by the fact that not long since I was in Nottingham to take part in a Frank O’Hara tribute at the Five Leaves Bookshop, and surmising there may be more than one or two O’Hara fans in the audience, I opt for “Poem (In Imitation of Frank O’Hara)”, which is exactly that and turns out to have been a reasonable choice. After a pause in which I take the risky step of asking people not to applaud after every poem (as if!) on the grounds that I could probably fit in another poem in the time lost, I make my way through the remainder of my twenty minute set. You can see, feel, the audience listening, responding in what I think of as the right way – a couple of laughs in the right places – and I can relax and enjoy what I’d doing. At the interval, Molly hustles and sells the relatively few books we’ve brought with us; I chat to friends, drink another (seriously good) flat white, and wait for the second part of the evening and half a dozen more readers – a good number reading for the first time – and it’s a real pleasure to hear so many good new poems – some humorous, some heartfelt, some both. I say my goodbyes, shake hands, and Molly and I set out for the station and the London train, the sounds of poetry and the strong sense of having had a better than good time reverberating around us. … Nothing too unusual, save for “Slow”, a poem I dedicated to Lee Harwood and Paul Evans, and which I thought to read after receiving a positive comment about it from John Kieffer on this blog, and the little poem set in the Botanical Gardens in Washington D.C. – as I said, the last thing you might expect coming out of. D.C during the week of Trump’s inauguration is a love poem. The U.S Botanical Gardens, Washington D.C.
green hose slack within the leaves. and helicopters hovering, a block beyond the Hill. for the muscles of the heart. The next poetry reading I have coming up is at Words & Jazz, Downstairs at the Vortex, in Dalston, East London, on Thursday 23rd March, after which I’m back in Nottingham on Wednesday, 12th April for an evening of Poetry & Jazz at Bromley House Library, with Ian Hill (saxophones) and Geoff Pearson (double bass). Then, on Friday 28th April, I’m at the Poetry Café in Covent Garden [or, just possibly, at Bar 48, Brixton, please check] for Fourth Friday, where I’m hoping to be reading alongside Debris Stevenson, with two sets from singer-songwriter, Liz Simcock. On Tuesday, 23rd May, along with Leah Fritz, Danielle Hope and others, I shall be reading at Primrose Hill Library, North London, in a benefit for the Marie Curie Hospice in Hampstead, and on Thursday of the same week, the 25th, I’m reading with the John Lake Band as part of the Brighton Festival Fringe. Oh, and I might sneak a few poems into my session at Almondbury Library, Huddersfield on Thursday, 9th February, when I’m talking about my 40-odd years as a writer. For memorial reasons, I’ve read, to myself and, occasionally, aloud to assembled others, a lot of Frank O’Hara this year. I read quite a lot of O’Hara most years. And I’ve read a little Robert Hass more days than not. This list recognises the other poetry collections I’ve read and enjoyed most in the past twelve months. … or you can’t keep a good poet down. I’ve blogged before about James Schuyler and the combination of pride and pleasure it gave me when Slow Dancer Press was the first to publish his Last Poems in their entirety in this country, together with an afterword by the British poet, Lee Harwood. At the time of writing that, April 2015, I thought there were no more than a few copies of that edition remaining, but, lo and behold, in the long overdue act of clearing out one of the cupboards in the room I rather grandly refer to as my office, what should I find but a treasure trove of Last Poems. Thirty copies, to be exact. For those of you to whom Schuyler is little more than a name, one of the lesser lights perhaps of the New York Poetry scene that congregated around Frank O’Hara and John Ashbery, this collection of late work – if read together with, say, the earlier, and quite wonderful, The Morning of the Poem – attests to the breadth and depth of his poetry, the meticulousness of his style. It follows naturally from this that a reader of Schuyler’s poems nearly always finds himself or herself in the present.Not a narrow present, but one that includes asides, memories, double-takes, and all the vivid associations that pour into the brain in a few minutes. Reading one of James Schuyler’s poems often feels like looking over his shoulder as he writes. The process is open to view. In fact the “process” is very much part of the poem. It’s akin to listening to Glenn Gould playing Bach’s Goldberg Variations (and Beethoven’s piano sonatas too). The way Gould tentatively plays the notes, searching his way through the music, as though recreating Bach’s thinking and progress as Bach builds a piece. As though making it up as he goes along. It could go this way? or that? no, this way. In his poem Shadowy Room Schuyler touches on this. Foolish it might have been to take my rucksack along to the recent Poetry Book Fair at Conway Hall, but how else was I going to take my trusty and, by now, well marked up copy of Out of Silence needed for my 11.00am reading, not to mention a bottle of water, box of Strepsils, sports pages of The Guardian, et cetera? As soon as I saw the number of stalls packed into the room, each of them packed with tempting publications, I made a quick promise to myself that, rucksack or no rucksack, I would buy three books and no more. The first was easy. Across the aisle from my own publisher, Smith/Doorstop, was (were? )Nottingham’s own Mother’s Milk Books [aim: to celebrate femininity and empathy through images and words, with a view to normalising breastfeeding], one of whose authors, Ana Salote, I met earlier this year at Lowdham Book Festival and shared a pleasant train journey with on the way home, so her book, Oy Yew, was my number one. Soon after that, I spied poet/publisher Tamar Yoseloff at the table consigned to Hercules Editions, the small press she runs with designer Vici MacDonald. Their books are beautifully designed limited editions, perfectly marrying images and words, and the only one I didn’t already have a copy of was right there in front of me – Ormonde, by Hannah Lowe, which documents the story of the ship which, in 1947, and thus pre-Windrush, brought her father and other Jamaican immigrants to this country. 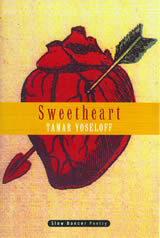 Tammy, of course, I had first met with my publisher’s hat on, when Slow Dancer Press published her 1994 chapbook, Fun House, and then, in 1998, her collection, Sweetheart. [Love that Jamie Keenan designed cover!] Her New & Selected Poems, A Formula for Night, will be published by Seren Books later this month. But on to number three. And yet again it was remarkably easy. The minute I drew level with the Carcanet Press table, my eyes were drawn to the nicely quirky cover of Tom Raworth’s As When, a fat and judicious selection ranging from his first collection, The Relation Ship, published by Cape Goliard in 1966 to Structure from Motion, published by Edge Books earlier this year. 139 poems, 248 pages, £14.99 – do the maths. A bargain, right. A bargain and a delight. When I got home, I looked for my original copy of The Relation Ship and there it was. Creased and battered, read and reread. Favourites asterisked or underlined. I imagine I bought it in Nottingham in 1975, either there or at the much-lamented Compendium in Camden, round about the same time that I bought Lee Harwood’s The White Room. 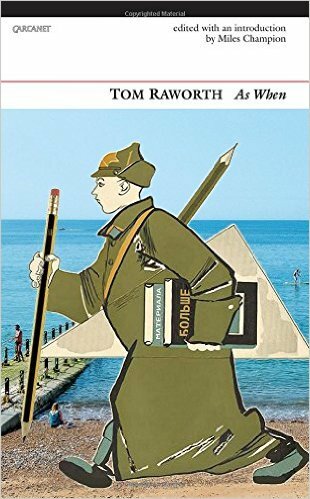 It was at a reading for Lee Harwood, held at the Redroaster Coffee House in Brighton last month, that I met Tom Raworth for perhaps the second or third time. I’d heard he’d not been all that well, and, in truth, he approached the stage with care, but once behind the microphone he roared like a mighty lion. The Raworth roar, once heard not easily forgotten. Like the poems. Put 15 poets in a room and ask them to read for just three minutes each – every organiser’s nightmare. 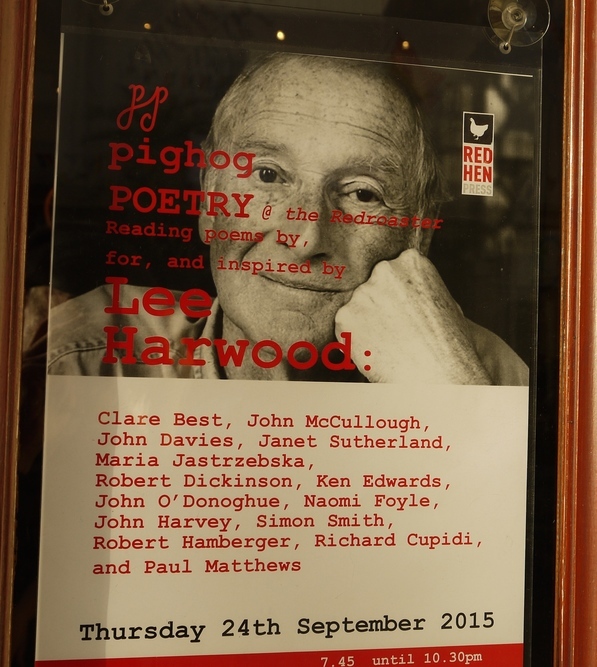 But that’s exactly what Michaela Ridgeway, putting on a Pighog night in honour of the late Lee Harwood, did yesterday at Brighton’s Redroaster coffee house, and, against all poetry reading odds, it worked. Starting promptly at 8.00pm (in itself some kind of first) the formal part of the evening wrapped up at 9.15, just five minutes behind schedule. Readers had been asked for either a poem of their own, dedicated to Lee or associated with him in some way, a poem of Lee’s and, possibly, a brief anecdote. Ken Edwards, with a new piece of writing, managed, superbly and with great humour, all three in one. 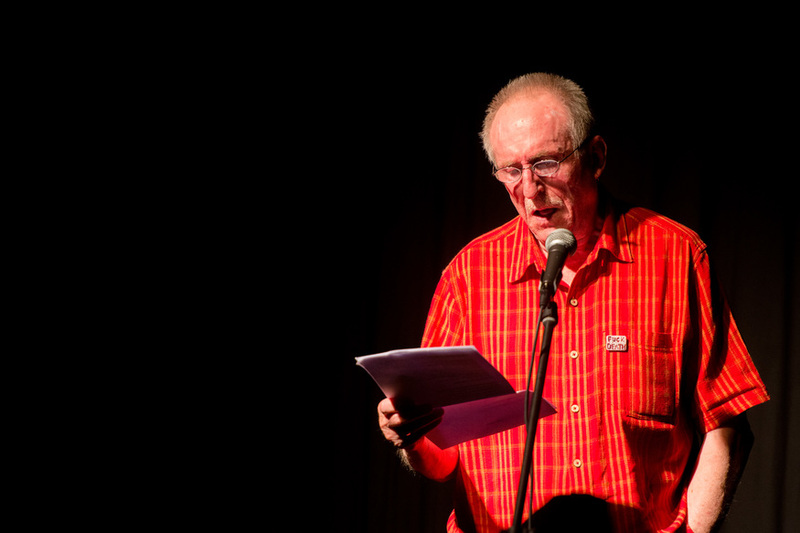 Some of those reading had been part of a monthly poetry group that Lee had guided for years; others – Richard Cupidi, Paul Matthews, Tom Raworth – were very much a part of Lee’s past, his poetry, and his Brighton life. In the absence of Robert Sheppard, editor of the comprehensive Salt Companion to Lee Harwood, I had been asked to introduce the evening, which I did, harking back, in part, to the first occasions on which I would have hear Lee read – at the ICA or the Roundhouse in the mid-70s and likely in the company of Libby Houston, Carlyle Reedy and The Liverpool Scene. In an interview I did with Lee for Slow Dancer magazine, he talked about one of Soho’s iconic early coffee bars, Sam Widges, where he used to hang out in the early 60s with the likes of Pete Brown, Libby Houston and Spike Hawkins, and where, for the first time, he came across the poetry of Tristan Tzara, a major influence on his writing. One of the few places that then stayed open through the night, I would sometimes fetch up there in the early hours after an all-nighter listening to Ken Colyer at Studio 51 – a style of music that, as Lee was quick to point out, he had long left behind. I went to listen to Ken Colyer when I was fifteen or sixteen, but then I converted to Charlie Parker and after that it was all modern jazz – Monk, Parker, the Jazz Messengers, Gillespie and then British bands, especially Joe Harriott and Shake Keane, whose music really hit home. I can’t explain why. I just loved it. And I suppose for the same reason I loved the writing of Tzara and Pound and later on Borges, Patchen, Rimbaud, William Carlos Williams, Kerouac, Ginsberg and so on. It was all the same cloth really. It was the same with painting. I loved Kandinsky – a range of forms floating on the canvas and in some way bonding. Appropriate then, that the last time I heard Lee read was at Shoreham WordFest in the autumn of 2014, when we were both performing with John Lake’s fine little four piece jazz group. Lee hadn’t worked with them before, but a mutual understanding quickly grew between them at rehearsals and on the evening itself the blend of music and words was just about perfect. It was great to see Lee in such fine form and clearly enjoying the experience as much as he did. If there had to be a final memory of him, this, for me, was about the best it could be.